Uurpan’s wedding venue and chapel is the perfect place to make your dream wedding a reality. Once you’ve seen it you will know why it is the best place to start your happily ever after. Our chapel is situated right next to the banquet hall and can seat up to 200 guests. With its nature surroundings, glass windows and magnificent view it makes it the perfect setting for your wedding vows. Protea Hotel Rustenburg Hunters Rest is nestled in between the Magaliesberg Mountains 8.5km from Rustenburg CBD this mountain range stretches from the North of Pretoria through to the South of the Pilansberg National Park located less than an hour away. Adjacent to the Kgaswane Nature Reserve Protea Hotel Rustenburg Hunters Rest offers a nature drive up to our famous viewing deck in the reserve with spectacular views of the mountain range and the Olifantsnek dam that were once home to roaming elephant herds. This is the perfect family getaway with the kids, a mere 1 hour and half’s drive from Pretoria, less than 2 hours’ drive from Johannesburg and less than an hour’s drive from Sun City. With loads of activities for both young and old. Nearby attractions include the Royal Bafokeng stadium, Magaliesberg Canopy Tour, Paul Kruger Country House, Cradle of Humankind, Hartebeespoort Dam, Elephant Sanctuary, Maropeng & Sterkfontein Caves. Protea Hotel Hunters Rest is a picturesque country resort nestled between the Magalies Mountains in the North West Province, only 25 minutes’ drive from Rustenburg, an hour’s drive from Sun City and 1.5 hours’ drive from Pretoria / Johannesburg. This stunning new venue can take up to 350 pax in an open air boma, under the stars, or up to 200 pax in the private inside venue. A quaint and unique chapel is next to the venue, or there is the option of getting married under the gazebo and trees. Whether you or your GUESTS are nature or romantic lovers, sport or active outdoor enthusiasts, the resort has all the amenities to ensure a memorable experience. On the R24 Rustenburg / Krugersdorp Road, 12 km outside Rustenburg, South Africa P.O. Box 775, Rustenburg 0300, South Africa Tel: +27 (0) 14 537 8300 Fax: +27 (0)14 537 8400 Email: bqmanager@huntersresthotel.co.za proteahotels.com/huntersrest. experience the freedom of the Bosveld. birdlife offers the utmost tranquillity and peace, creating a real Bos Baroque feel. with your loved ones. The Bos Baroque can host up to 150 guests. Villa Paradiso is a beautiful Country Manor on the eastern outskirts of Hartbeespoort Dam. It is only 20 minutes drive from Pretoria’s Church Square, 55 minutes from O R Thambo International Airport and 20 minutes drive from Lanseria Airport. Villa Paradiso Country Manor is owned by Corne’s Caterers, this well known company has been in business for more than 30 years. Villa Paradiso Country Manor is also famous for our Traditional Sunday Lunch Buffet, that can be enjoyed in tranquil surroundings. 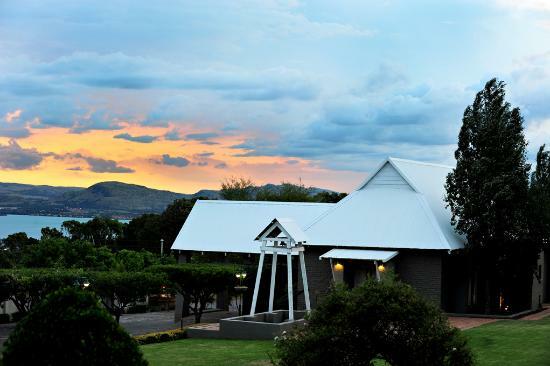 Come take your marriage vows in our “State of the Art” In-door Chapel, (seats 150), that arises above the terrace between the mountain and the breathtaking mass of water from the Hartbeespoort Dam. If you prefer a fresh Open Air wedding, our Garden Gazebo (seats 120) will provide you with a memorable panoramic view of the natural surroundings. Our “Populus Lane” Out-door wedding ceremony venue, (seats 200) are surrounded by a privacy screen of lush green Poplar Trees and overlooking our own farm dam, complete with a Willow Tree and qute little ducks roaming free. Any photographer’s dream! The bell will be ringing in jubilation to announce the starting or after the sanctioning of the ceremony. Contact us for more information and to book your site visit. These cases are perfectly simple and easy to distinguish. In a free hour, when our power of choice is untrammelled and when nothing prevents our being able to do what we like best, every pleasure is to be welcomed and every pain avoided. At vero eos et accusamus et iusto odio dignissimos ducimus qui blanditiis praesentium voluptatum deleniti atque corrupti quos dolores et quas molestias excepturi sint occaecati cupiditate non provident, similique sunt in culpa qui officia deserunt mollitia animi, id est laborum et dolorum fuga.